NASA is reviewing 12 proposals for its next robotic mission to explore the solar system under the agency's New Frontiers Program. When it comes to picking the next mission to explore the solar system, NASA certainly has options. The space agency is reviewing a dozen ideas for a robotic solar system probe that will launch sometime in the mid-2020s. 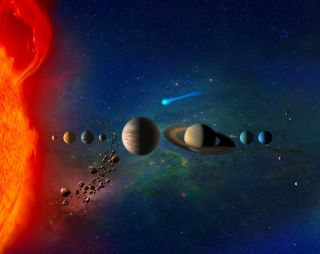 The 12 mission proposals are part of NASA's New Frontiers program, which aims to send ambitious missions to explore the solar system with a cost of no more than $1 billion. Past New Frontiers missions include the New Horizons probe that flew by Pluto in 2015, the ongoing Juno mission at Jupiter and the OSIRIS-REx mission, which will visit the asteroid Bennu and return samples to Earth. NASA will announce the selection of one or more concepts for a Phase A study in November, agency officials wrote in the statement. Once the Phase A study round is complete, NASA officials plan to select a final New Frontiers proposal to advance into "subsequent mission phases," NASA officials said. "Mission proposals are selected following an extensive competitive peer review process." You can learn more about NASA's New Frontiers Program at its website here.